The Oscar class, Soviet designations Project 949 Granit and Project 949A Antey, (NATO reporting names Oscar I and Oscar II respectively), are cruise missile submarines (SSGNs) designed in the Soviet Union for the Soviet Navy. They are currently in service with the Russian Navy with some of the vessels planned to be modernized into the Project 949AM to extend their servicelife and increase combat capabilities. The Project 949 submarines were the largest cruise missile submarines in service until the Ohio-class ballistic missile submarines were converted to carry cruise missiles in 2007. They are the fourth largest class of submarines in displacement and length. Only the Soviet Typhoon-class, Russian Borei-class and the American Ohio-class ballistic missile submarines (SSBNs) are larger. The first submarine of Project 949 was laid down in the mid-1970s and was commissioned in 1980. In 1982 an updated and larger version (Project 949A) replaced the earlier version. In total thirteen submarines were constructed. The Oscar class was designed to attack NATO carrier battle groups using long-range SS-N-19 "Shipwreck" anti-ship missiles and targeting data provided by the EORSAT satellite system (via the submarine's "Punch Bowl" antenna). In the financial problems that followed the fall of the Soviet Union the Oscar class was prioritized by the Russian Navy and when many older submarine classes were retired the Oscar class remained active in both the Northern and Pacific Fleets. As of 2011[update], five submarines are currently active with several more in reserve or waiting for repairs. In 2011, it became known the Rubin Design Bureau is working on a new modernization variant, that will primarily include replacement of the P-700 Granit missile system with the newer P-800 Oniks or Kalibr anti-ship/cruise missiles. The modernization is to be carried out by the Zvezdochka and Zvezda shipyards. In September 2015, during a visit to the Zvezda shipyard at Bolshoy Kamen, Russian Defence Minister Sergey Shoygu announced that at least three Oscar-class submarines will undergo repair and modernization to extend their service life by 20 years. The upgraded submarines will be known as "Project 949AM", according to the Russian officials. The cost of the modernization is estimated at RUB12 billion (US182 million) per a submarine. In September 2016, it was reported submarines K-132 Irkutsk and K-442 Chelyabinsk are undergoing modernization to the Project 949AM. According to the Deputy Prime Minister of Russia Yury Borisov, Russia's Pacific Fleet may get four upgraded Oscar-class submarines armed with Kalibr cruise missiles by 2021. Two Project 949 Granit submarines were built at Severodvinsk between 1975 and 1982 and assigned to the Soviet Northern Fleet. K-525 was laid down in 1975 and K-206 was laid down in 1979. After the construction of the first two submarines, production continued with the improved project 949A Antey. Both submarines of the Project 949 were decommissioned in 1996 and scrapped in 2004. Eleven Project 949A Antey submarines were completed at Severodvinsk, of which five were assigned to the Soviet Northern Fleet. At one stage it had been planned to develop a new fourth-generation follow-on to the Project 949A, but this plan was later dropped. The external differences between the two classes were that the 949A class is about 10 metres (33 ft) longer than its predecessor (~154 metres (505 ft) rather than 143 m (469 ft)), providing space for improved electronics and possibly quieter propulsion. Some sources speculate that the acoustic performance of the Oscar II class is superior to early Akula class but inferior to the Akula II class as well as subsequent (4th generation) designs. It also has a larger fin, and a seven-bladed propeller instead of a four-bladed one. Like all post-World War II Soviet designs, they are of double hull construction. 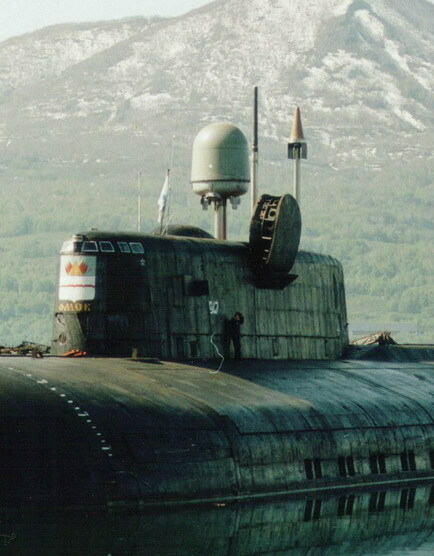 Similarly, like other Soviet submarine designs, Project 949 not only has a bridge open to the elements on top of the sail but, for use in inclement weather, there is an enclosed bridge forward and slightly below this station in the fin/sail. A distinguishing mark is a slight bulge at the top of the fin. A large door on either side of the fin reaches this bulge. These are wider at the top than on the bottom, and are hinged on the bottom. The Federation of American Scientists reports that this submarine carries an emergency crew escape capsule; it is possible that these doors cover it. The VSK escape capsule can accommodate 110 people. New modernization variant first announced by the Russian Defence Ministry in 2011. The modernization includes replacement of the 24 P-700 Granit anti-ship missiles with 72 newer P-800 Oniks or Kalibr anti-ship/cruise missiles. No design changes to the hull will be required as the missiles will fit into the existing launchers outside the pressure hull. The modernized boats will also get upgraded Omnibus-M combat information and Simfoniya-3.2 navigation systems, as well as new fire-control system, communications, sonar, radar, and electronic intercept equipment. The modernization aims to bring the submarines up to the same technological level as the Russia's next-generation Yasen-class nuclear-powered cruise missile submarines. In December 2012, construction began on a special purpose research and rescue submarine, designated Project 09852, and based on the incomplete Project 949A (Oscar II class) submarine Belgorod. The submarine is reportedly designed to carry both manned (e.g. Project 18511 midget submarine) as well as unmanned (e.g. Klavesin-1R) underwater vessels. However, while carrying smaller unmanned underwater vehicles (UUVs) would be possible as-is on an Oscar-class hull, the accommodation of a midget submarine such as Project 18511 Paltus or the even larger Project 10831 Losharik, would probably require a major hull extension in order to accommodate a docking compartment. For example, the length of the submarine BS-64 Podmoskovye was increased by 9 metres (30 ft) even though the SLBM missile compartment was completely removed. Belgorod will be reportedly used as a carrier of the rumored Poseidon (NATO reporting name Kanyon) nuclear-powered, nuclear armed unmanned underwater device capable to carry a 100 Mt nuclear warhead, with six such devices being carried horizontally (on each side of the submarine) in place of the 24 P-700 Granit (SS-N-19 Shipwreck) launchers for a total yield of 600 megatonnes. It is estimated that Belgorod will be 184 metres (604 ft) long which would make it the longest submarine in the world. On 23 April 2019, Belgorod was floated out of a slipway during a ceremony at the Sevmash shipyard, watched by the Russian President Vladimir Putin via a TV-link. Further work will be completed afloat and the submarine is scheduled to start its factory and state trials in 2020 after it will be delivered to the Russian Navy. ^ "ЦАМТО / Новости / До 2025 года Минобороны РФ намерено модернизировать 4 атомные подлодки для ТОФ". www.armstrade.org. ^ a b c "Russia to Complete and Modernize Antei-class Subs". rusnavy.com. ^ Siddiqi, Asif (November 1999). "Staring at the Sea: The Soviet RORSAT and EORSAT Progammes" (PDF). Journal of the British Interplanetary Society. 52 (11): 397–416. ^ "SSGN Oscar II Class (Project 949.A) (Kursk) – Naval Technology". naval-technology.com. ^ a b "Атомные подлодки проекта "Антей" пройдут перевооружение". lenta.ru. 12 December 2011. Retrieved 4 March 2019. ^ a b "Russia details ambitious effort to modernise nuclear-powered submarines to bolster order of battle". Archived from the original on 2 December 2015. Retrieved 4 March 2019. ^ a b "Russia initiates multiyear plan to modernise Oscar II SSGNs". Archived from the original on 2016-05-21. Retrieved 4 March 2019. ^ "Russia to upgrade only part of nuclear-powered Antey submarines". TASS. 29 September 2016. Retrieved 4 March 2019. ^ "Russia's Pacific Fleet to get four upgraded nuclear subs by 2021". TASS. 6 February 2018. Retrieved 4 March 2019. ^ a b c "Oscar 1 class". Military Today. Retrieved 2011-12-30. ^ a b c "Zvezdochka dismantling two nuclear subs". Bellona Foundation. 2 April 2004. Archived from the original on 22 March 2012. Retrieved 30 December 2011. ^ "China's Noisy Nuclear Submarines » FAS Strategic Security Blog". Fas.org. Retrieved 2013-03-24. ^ a b "Project 949 Granit / Oscar I ; Project 949A Antey / Oscar II". Federation of American Scientists. Retrieved 2011-12-30. ^ "949 /A Oscar I/II class". warfare.be. Retrieved 1 January 2012. ^ "A Mystery In The Deep". The Daily Beast. Archived from the original on 16 January 2012. Retrieved 6 September 2017. ^ a b "Russia builds deep-sea research submarine". World-nuclear-news.org. 2012-12-21. Retrieved 2013-02-06. ^ "Russia builds nuclear submarine for deep-water research". Barents Observer. Retrieved 29 April 2013. ^ a b c "Spy Subs -Project 09852 Belgorod". hisutton.com. Retrieved 23 April 2019. ^ John Pike. "Project 210 Losharik". Globalsecurity.org. Retrieved 2013-02-06. ^ "Analysis - Russian Status-6 aka KANYON nuclear deterrence and Pr 09851 submarine". hisutton.com. Retrieved 23 April 2019. ^ "Russia's nuclear underwater drone is real and in the Nuclear Posture Review". defensenews.com. 12 January 2019. Retrieved 23 April 2019. ^ "The Truth Behind Russia's 'Apocalypse Torpedo'". popularmechanics.com. 18 January 2019. Retrieved 23 April 2019. ^ "Now, Russia builds a submarine even bigger than the Typhoon". thebarentsobserver.com. 3 May 2017. Retrieved 23 April 2019. ^ a b "Russian Navy to Receive Biggest and Most Unique Nuclear Submarine in the World". Sputnik (news agency). 23 April 2017. Retrieved 23 April 2019. ^ a b "Russia floats out first nuclear sub that will carry Poseidon strategic underwater drones". TASS. 23 April 2019. Retrieved 23 April 2019. ^ Rogers, James (2019-04-24). "Russia launches huge 'doomsday' supersub". Fox News. Retrieved 2019-04-24. ^ "Nerpa Shipyard Starts Dismantling of Nuc Sub Krasnodar". rusnavy.com. ^ "Soviet-Era Nuclear Submarine Catches Fire During Disassembly". ^ "Подводный крейсер К-132, "Иркутск". Проект 949А". www.deepstorm.ru. ^ a b "Russia to equip nuclear-powered Oscar-class submarines with Kalibr cruise missiles". ^ a b "Russia to upgrade only part of nuclear-powered Antey submarines". ^ ЦС "Звездочка" завершил ремонт атомного подводного ракетного крейсера К-119 "Воронеж" [CA "Star" completed the renovation of nuclear submarine K-119 "Voronezh"]. flot.com (in Russian). I-mash.ru. Retrieved 2012-01-01. ^ "Repair Works Started on SSN Smolensk". rusnavy.com. ^ Ольга ЕФРЕМОВА - Сайт «Комсомольской правды» (31 December 2013). "Атомоход «Смоленск» в 2014 году посетит Северный полюс". ^ "Подводный крейсер "Орел" отправился к месту базирования". 6 April 2017. ^ "Nuclear-powered Oscar-class submarine returns to Russian fleet". ^ "Defense shipyard Zvezda claims RUR 65 mln for repairs of SSGN Omsk". rusnavy.com. 7 September 2010. Retrieved 2012-01-01. ^ "Court obliged Pacific Fleet to pay for repair of SSN Omsk". rusnavy.com. 8 April 2011. Retrieved 2012-01-01. ^ "Подводный крейсер К-186, "Омск". Проект 949А". www.deepstorm.ru. ^ "Nuclear submarine Tomsk returns to Kamchatka naval base having completed naval combat training tasks : Ministry of Defence of the Russian Federation". eng.mil.ru. ^ "Russia to Convert Belgorod Submarine for Special Missions". Sputnik (news agency). 9 February 2012. Retrieved 23 April 2019. Wikimedia Commons has media related to Oscar class submarines. "The Kursk Crisis". deepspace4.com. 23 August 2000. Archived from the original on 18 July 2011. "Oscar-class subs and Soviet RORSATs". Friends and Partners. 1 September 2000.